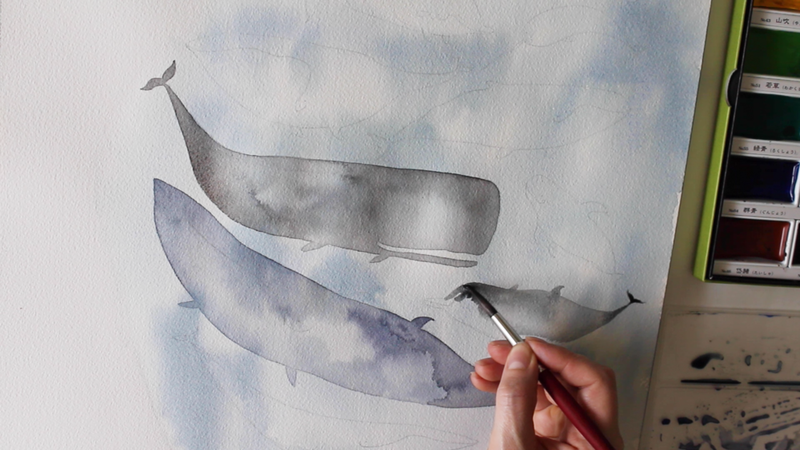 Watch me watercolor and chat about my latest subjects - eleven wonderful Whales of the World. I do have giclée prints of this in my Etsy Shop if you’d like to hang with these chummy creatures. I made a rough sketch of this image to size and transferred it onto this Arches watercolor block by doing the “scribble all over the back” method. I always lightly sketch the image first when I do these more involved pieces for extra peace of mind. I used a wet-on-wet watercolor technique for the background by creating a water puddle on the page and dabbing a variety of blues within the still wet puddle. This makes for a soft and flowing wash of color. I always try to get as close to the look I’m going for with my subjects in the first later. I play around with color and gradation, dark and light and just have fun, since this is one of my favorite parts of the piece. Some tips here - mix up the colors and see how the interact for little points of interest. I used alllll the shades of blue. 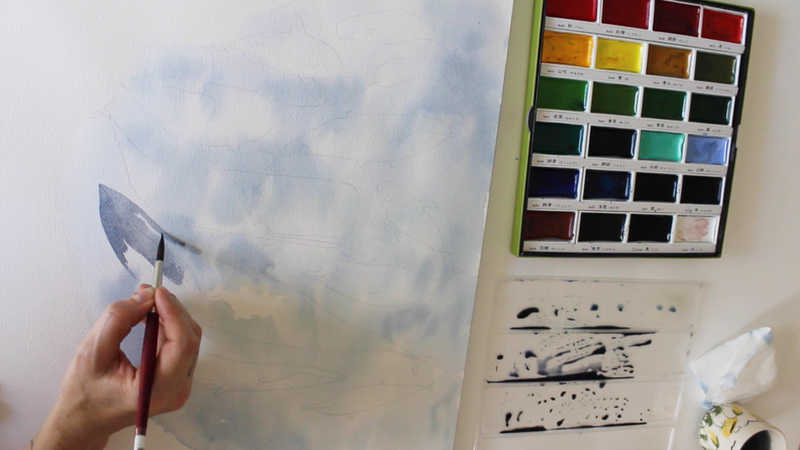 Also, the paper towel is your friend… if you feel that you need to create more lightness you can always dab some pigment off the piece when it’s still wet - I do this a lot. My favorite part! Always. Adding the expressions on my little creatures. This is when their personalities emerge and I really get to know them. I am using a 4B graphite pencil. Sharp. 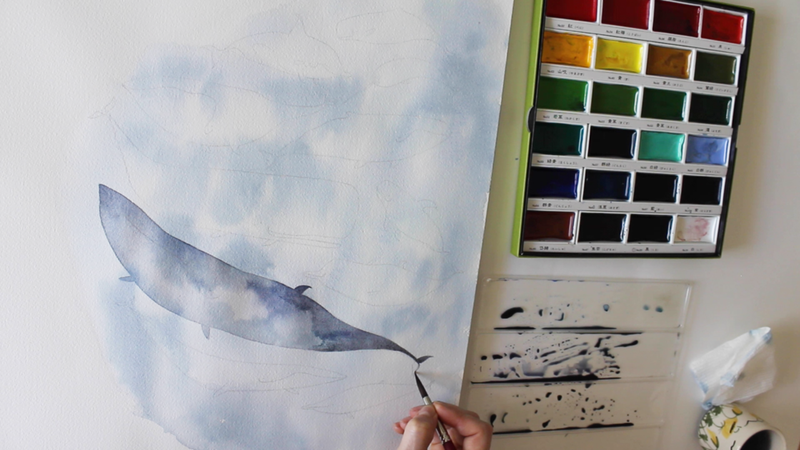 The second layer of the watery background to add deepness. This goes right over the whales because I want them to feel like they are one with the water… rather than in the foreground. I usually will add one final light touch of shadow on the creatures, just to bring that extra something. I’ll do this with a mix of paint and colored pencil. 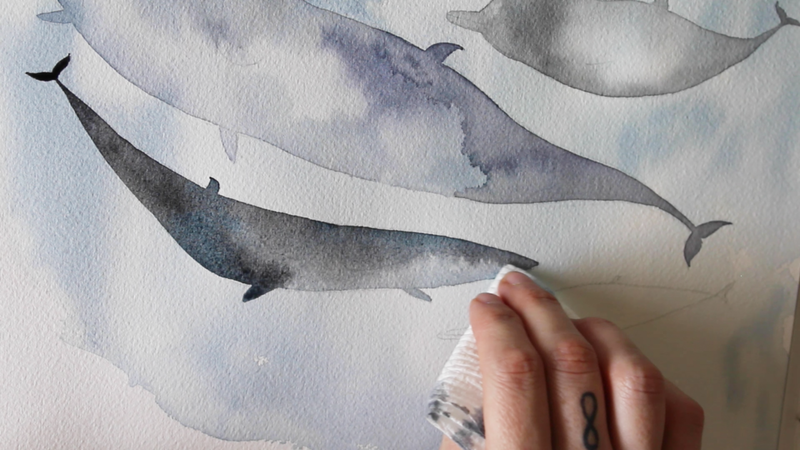 I just love adding my signature to a piece… it is oh so gratifying.